Point Park University - ThoughtForm, Inc. Located in downtown Pittsburgh, Point Park University is a liberal arts institution that for many years has been a shining example of a true urban campus. Every day, Point Park University students benefit from the unique relationship between the school and its city neighborhood. The Academic Village initiative is helping to develop a “multi-block living and learning hub” that transforms campus life for the students. It has revitalized the university’s connection to downtown businesses and cultural institutions. 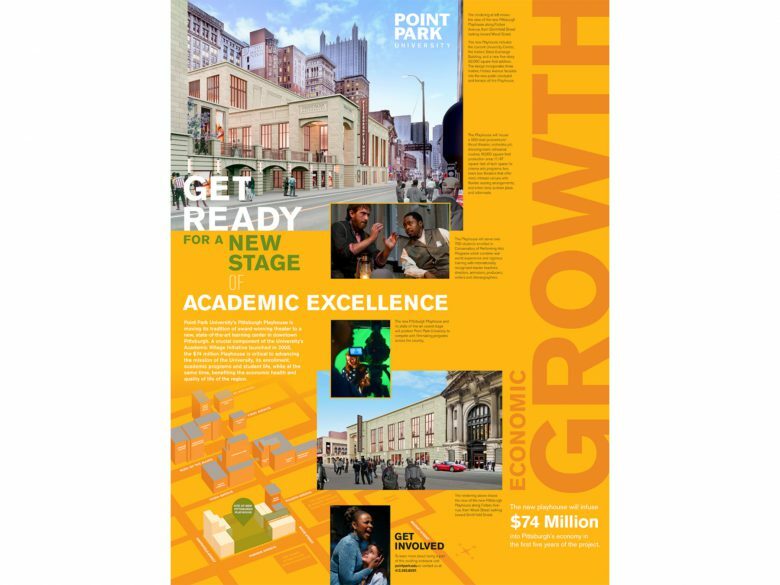 Point Park University enrolls more than 3,800 full- and part-time students in 82 undergraduate programs and 18 doctoral-level graduate programs. 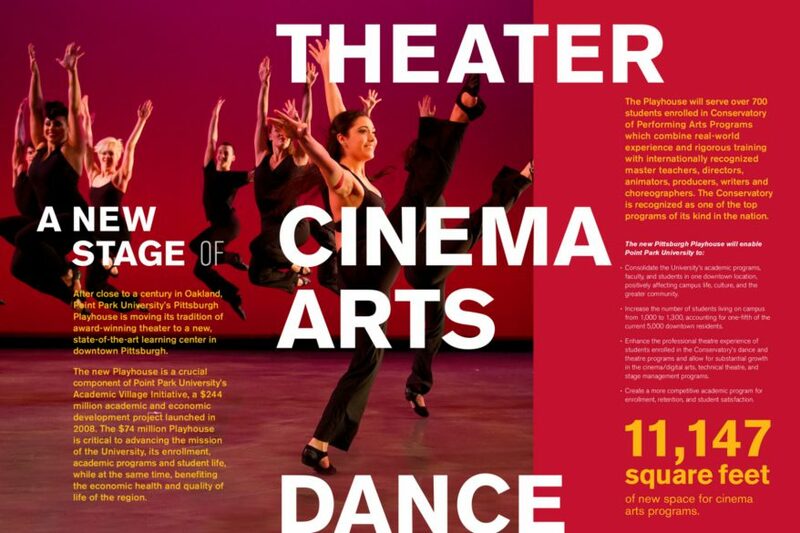 These programs are offered through its four schools: Conservatory of Performing Arts, School of Arts and Sciences, School of Business, and School of Communication. In one of the last phases of Point Park University’s Academic Village expansion, the university undertook a major capital campaign to move the long-respected Pittsburgh Playhouse from Oakland to Point Park’s downtown campus. This new state-of-the-art, LEED-certified facility is the expansion’s crowning achievement. This effort needed a compelling and persuasive communications plan to generate support from a wide range of private and public donors. 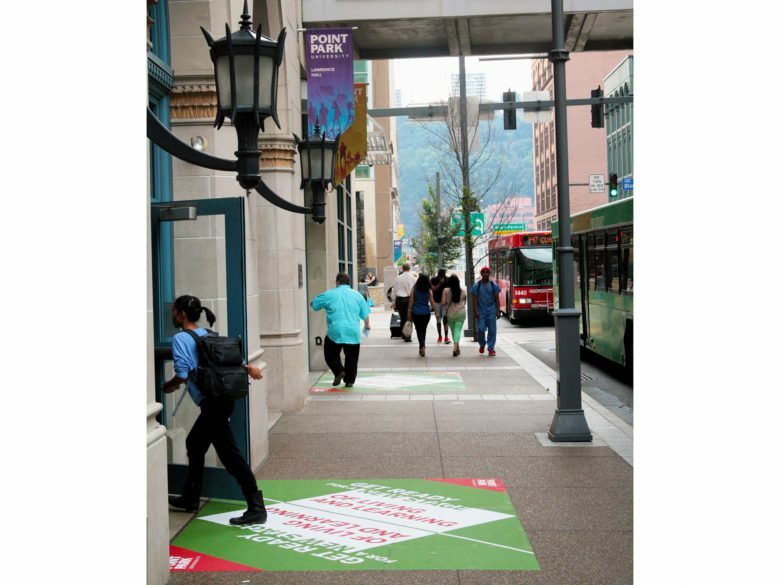 ThoughtForm helped Point Park stakeholders align on the milestones for the campaign, from quiet phase to public launch to maintenance. Once a campaign roadmap was in place, ThoughtForm created an identity for the campaign titled Get Ready for a New Stage. This new identity acted as a springboard for the campaign, including the development of creative and engaging campaign materials. At over $40 million raised, Get Ready for a New Stage is the largest and most successful campaign for the university to date. Download the full project story to learn more!